Feldbluse M40 for Mannschaften ans Non-commissioned officers from Wehrmacht or Waffen SS. 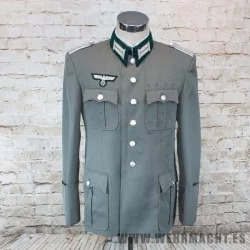 Made of late war Feldgrau wool, includes Infantry Wehrmacht EM Shoulder Boards M40. Eagle and Collar patches are sold separately, please select your rank for complete your feldbluse. The "M40" field blouse was the most manufactured and issued field blouse of WWII, remaining in production as late as 1943. It was identical to the M36 in cut, but the collar was made of field-gray instead of dark green badge cloth. The M40 features pleated pockets with scalloped flaps, cotton twill lining, split cuffs, first aid dressing pocket, provisions for internal suspenders, shoulderboard loops, hook and eye at the collar and reproduction buttons. REMEMBER, THE SEWING SERVICE REQUIRES A PERIOD OF 10 DAYS.